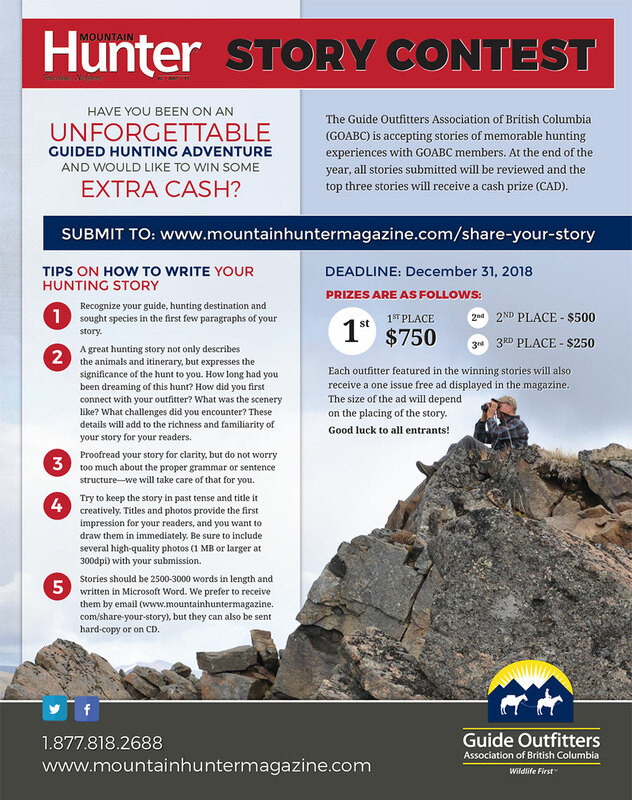 The Guide Outfitters Association of BC (GOABC) is accepting stories of memorable hunting experiences with GOABC members. These stories may be chosen for publication in the Mountain Hunter™ magazine. At the end of the year all stories submitted will be reviewed and the top three stories will receive a cash prize (CAD) from $250 to $750. Each Outfitter featured in the winning stories will also receive a one issue free ad displayed in the magazine. Story selection and editing is the responsibility of the Mountain Hunter™ magazine editors. There is no minimum or maximum word count for story submissions. The recommended approximate word count range is 2,000 – 3,000 words. Stories must be written by the client of a GOABC member. All submissions chosen for publication require the given consent of the writer and the outfitter featured. You can submit your story and upload it via the upload file feature on our online form. Stories can be submitted as a WORD document or as plain text. Please upload at least one photo that illustrates your hunting story. We will review your story and if it is chosen for publishing we will contact you for more photos to accompany the story. For photos – our form will allow .png, .jpg, .pdf file types and the file size must be less than 4 MB. Please upload at least one photo that illustrates your story. Photos must be under 4MB filesize.